Recess by Henri Gillet from Perkins Bacon Plates 1854 (April): 5 c. Burnt Siena, wmk. pos. 4, a fine unused example with ample to large margins all round, in a rich dark shade, slight age stain at base otherwise fresh and fine unused, without gum. 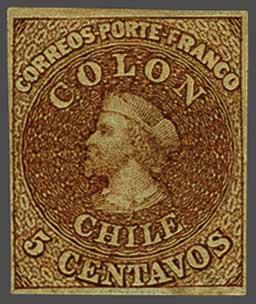 A lovely example of an exceedingly scarce stamp Gi. 10 = £ 1'700/Scott = $ 1'800.